Olivia. 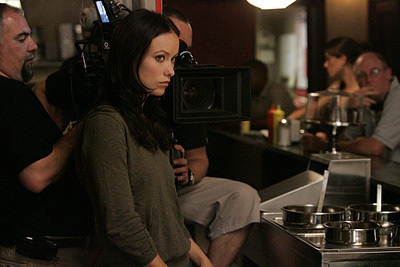 Olivia Wilde behind the scenes of the episode "The Only Thing Sure". Wallpaper and background images in the The Black Donnellys club tagged: the black donnellys image picture the only thing sure jenny olivia wilde behind the scenes. This The Black Donnellys photo contains stove, kitchen stove, range, kitchen range, cooking stove, and kitchen. There might also be kitchenette, dishwasher, dish washer, dishwashing machine, and range hood.